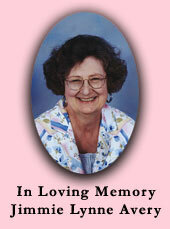 Jimmie Lynne Avery, age 65, of Athens, TN, died Monday, October 26, 2009 at her home, surrounded by family and loved ones. Succumbing to a life long lung birth defect and resulting lung disease of which most of her Lact-Aid mothers and babies never knew she had. She was still helping and counseling mothers four days before her death. Jimmie Lynne helped countless thousands of mothers and babies with a sweet touch that only she had. For nearly forty years Jimmie Lynne would not let any one else at Lact-Aid answer the phone or take orders. She would say that was the most fun job there was “ talking with and helping mothers and babies”. In her spare time, Jimmie was a prolific and published writer, preferring to write poetry to capture the love she felt for her husband and her family. babies is of paramount, that created Lact-Aid International. All of us at Lact-Aid, are dedicated to carry on her visions and beliefs and make sure that Lact-Aid is always available now and into the future. I would like Jimmie Lynne to be recognized and remembered for her selfless dedication to her Lact-Aid mothers and babies. I was blessed and it was a remarkable journey spending 49 years with Jimmie. I was also blessed to have a poet for a wife, who wrote and left me so many insights into her love, heart and soul. It is with this in mind that I would like to share some of her last words and a poem she left for her family and loved ones, for the Lact-Aid mothers and babies were part of her family.